The World Cup 2018 is here and with it comes all the drama, all the emotional highs and low plus, of course, all the action – best enjoyed big. We don’t mean big screen big, we mean projector big. From watching World Cup matches on your own to hosting friends and family to enjoy the game, it’s better on a larger display. You can’t get much larger than a whole wall of your house, something a projector can turn into a screen. Once upon a World Cup it was either too expensive to own a projector at home or the picture quality just wasn’t that good. Now, not only is the quality better than ever but the prices are lower, too. While you might not want a wall-encapsulating sized picture all the time, a projector allows you to roll it out only when needed. The result should be that watching the big game feels like a special occasion. So what do you need to get a projector up and running in your home ready for the World Cup? You don’t need a literal screen but something to throw the image onto. If you’ve got a white wall that’s smooth and not obstructed by anything this could be perfect. Even a coloured wall could work as some projectors, like Epson, offer an offset to work on coloured walls. What most people opt for is a rollout screen which can be snapped up for very little. This does limit your size but it allows you to have the projector set to the perfect size and focus so it’s easy to roll out and get viewing. Lots of projectors are just that and nothing more. That means you need to get an HDMI cable in from your set top box or console to actually feed it content. Since most projectors, short throw models aside, need to be far from the screen or wall, you’re going to need a long cable. Make sure you have at least one decent and pretty long HDMI cable that can be rolled out to connect the projector to your feed. For the World Cup it’s aired on BBC and ITV so a set-top box output is ideal but playing BBC iPlayer on a PS4, for example, could work, too. You may need an optical cable to output to an audio system too, so think long there, too. There several good options out there that’ll suit your needs. Obviously, price can be a major issue so be sure you know what you have to spend. If money is no object then the Sony 4K Ultra Short Throw Projector is a pretty stunning bit of kit that also doesn’t take up much room. But since that’s over £20,000 most people are probably going to want to read on. 4K UHD is essential as high resolution means that larger picture won’t show pixelation. That said, Full HD can still look great if the setup is right, so that could be a way to grab a saving. You’ll want to keep an eye on that lumen count or contrast ratio so you get enough brightness, especially if you’re planning to watch in the daytime without curtains closed. Motion refresh rates are also important as that’s what gives you a nice smooth picture where you can track the ball and not a blur of pixels. Many projectors have a Sports Mode which can be perfect for this enhanced motion coverage. Audio is another issue. Some projectors do come with built-in speakers, but don’t expect amazing sound. You may need to budget for a separate sound system to get the best out of that big screen. Pricing can vary widely with projectors, but if you were to go for a 4K UHD option you could grab up a brand like Optoma for less with the UHD300X at about £1,189 that includes UHD, a max 302-inch screen size and impressive 250000:1 contrast ratio with a day and night adjustment mode. Or go for a well known projector brand like Epson where a Full HD EH-TW7300 for £1,899 will give you a decent 16000:1 contrast ratio, 300-inch max screen but that famous 3LCD tech for more vibrant colours than the competition. 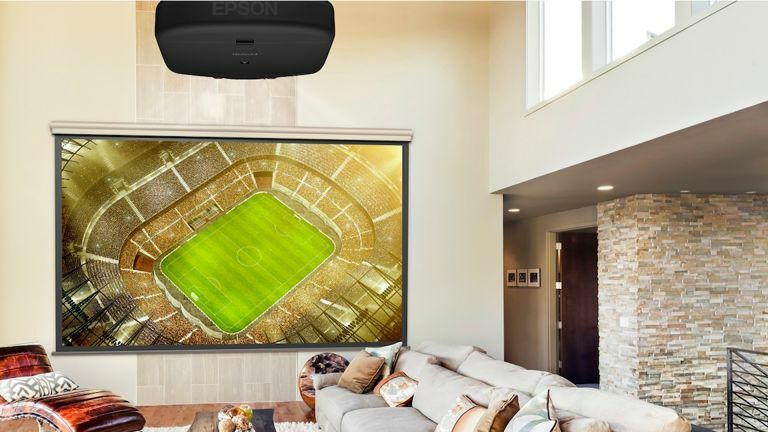 The motion refresh rate on an Epson is also excellent, making it ideal for football matches. Or go for the Sony Xperia Touch Portable Projector that offers a built-in battery, Wi-Fi, touchscreen controls on the projected display and a max 80-inch screen. Plus this runs Android and comes with speakers built-in – the ideal mobile projector setup.